Recorded Monument GA 086:15003 (St. Killaan’s Well) is located c. 35 m north east of Killaan Church and Graveyard. It may be spotted from the eastern end of the graveyard as a small copse of trees in the adjoining field. This is one of two wells in the locality. Recorded Monument GA086:149 (Toberlaan) is located further east in the next field. 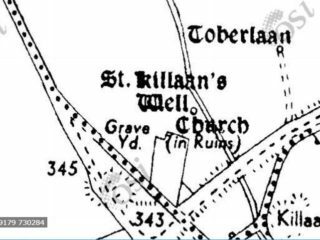 Permission has been granted by the National Monuments Section, Department of Arts, Heritage, Regional, Rural and Gaeltacht Affairs to clear the site of St. Killaan’s Well of overgrowth. 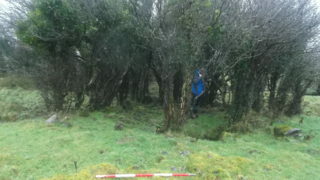 Bernadette Doherty, Consultant Archaeologist was deployed to monitor works and record the well by planning and photographing it. No excavation works were permitted. This project was introduced in our Heritage Week 2017 Walk & Talk on Tuesday 22nd August 6.30pm. Dr. Christy Cunniffe, Galway Community Archaeologist gave an enlightening talk at the well to the thirty or so in attendance. Take a virtual tour of the site thanks to Digital Heritage Age and 3D Photography taken on site. There are a number of spellings for the name. Laebhan, Leban, Liban, Loebhain, Leaain. The earliest reference to this saint is from the Annals of the Four Masters under AD448. St. Laebhan was a smith to St. Patrick. William Reeves notes that in the recital of St. Patrick’s muintir or family…there occur the names of three smiths expert at shaping; MacCecht, Laebhan and Fortchern. The aforementioned smith to Saint Patrick, Maccectus of Domhnach Loebain or Church of Laan, reportedly made a relic known as the finnfaidheach. O’Donovan notes the relic was lost through time and states he ‘never met any authority to prove what it was. However, ‘Mr. Petrie thinks it was a bell’. Could it be the famous bell of St. Patrick?. This is currently in the care of National Museum of Ireland. 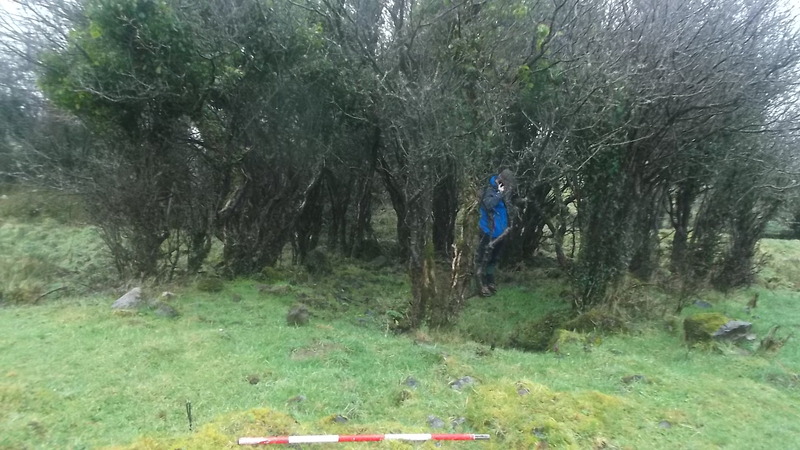 Thanks to Michael Mullins, landowner, for permission to gain access onto his land. This page was added on 30/07/2017.